Description: It was a great weekend at the 22nd Annual Collingwood Elvis Festival with this year's theme: Elvis Timeless. The weather was amazing and so were the Elvis Tribute Artists. Many new Youths took to the stage and nice to know the Elvis legacy will carry on. BEACH CORNER was on site where Dianna got to interview this year's VIPs and ETAs. Did you know that Elvis had a private nurse? Meet Letitia Henley Kirk who kept her secret for 38 years about her years with Elvis, Jimmy Velvet a 1950's artist who is know for singing such songs as "Teen Angel" to name a few. Jimmy got to meet Elvis at 15 years old and remained life long friends until his untimely passing in 1977. Charles Stone, concert promoter who was a fan of Elvis got the good fortune to work with Elvis Presley. Some of this year's ETAs, Oliver Steinoff from Germany, Kraig Parker from Dallas, Texas, Gordon Hendricks from UK and Robin Kelly from Ontario. BEACH CORNER from Beach BOOSTER Radio ON DEMAND, available anytime on any device from our Beach BOOSTER Radio Podcast Page. Please share! 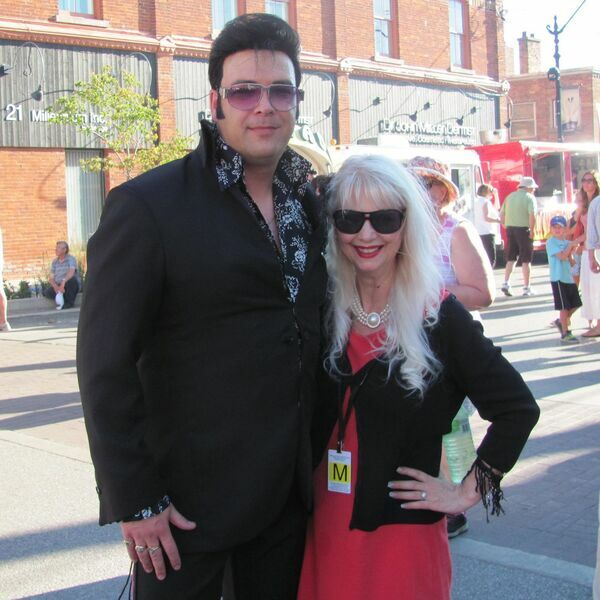 It was a great weekend at the 22nd Annual Collingwood Elvis Festival with this year's theme: Elvis Timeless. The weather was amazing and so were the Elvis Tribute Artists. Many new Youths took to the stage and nice to know the Elvis legacy will carry on. BEACH CORNER was on site where Dianna got to interview this year's VIPs and ETAs. Did you know that Elvis had a private nurse? Meet Letitia Henley Kirk who kept her secret for 38 years about her years with Elvis, Jimmy Velvet a 1950's artist who is know for singing such songs as "Teen Angel" to name a few. Jimmy got to meet Elvis at 15 years old and remained life long friends until his untimely passing in 1977. Charles Stone, concert promoter who was a fan of Elvis got the good fortune to work with Elvis Presley. Some of this year's ETAs, Oliver Steinoff from Germany, Kraig Parker from Dallas, Texas, Gordon Hendricks from UK and Robin Kelly from Ontario. BEACH CORNER from Beach BOOSTER Radio ON DEMAND, available anytime on any device from our Beach BOOSTER Radio Podcast Page. Please share!